In 1862, Joseph Hahn and two companions struck gold in the vicinity of Hahns Peak just north of Steamboat Springs. Over a century later, David Pratt, owner of Three Forks Ranch, has struck gold in the form of the fly-fisherman’s nirvana by restoring 22 miles of three rivers that now teem with Donaldson and Kamloops Rainbows measuring over 30 inches. Mr. Pratt’s legacy on this Earth will not be that he is a co-owner of the Saint Louis Cardinals, not that he is founder of United Industries; but that he identified, funded, and restored the single largest, privately stream restoration project in the United States -- the Little Snake River (North, Middle, and South Forks). With the help of Ranch Manager Jay Linderman and Stream Restoration Guru Dave Rosgen of Wildland Hydrology, Three Forks Ranch has gone from a near-dead fishery and ranch wrought with over-grazing problems, to a world class fishery that demands attention from anglers not only for the size and quantity of fish they will catch, but also for the sustainable investment in their restoration project which has created the West’s finest fishery. 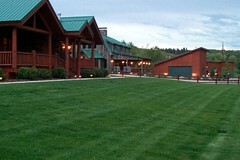 The Three Forks Ranch is an Orvis endorsed Fly Fishing destination that not only entails world-class fishing but also standards of excellence in hospitality, accommodations and professional guides. The Lodge encompasses 16 miles of the Little Snake River, Middle Fork, North Fork and its tributaries including 30 heavily stocked oxbow ponds with 200,000 acres of outdoor paradise. 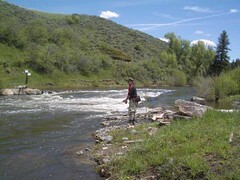 Three Forks is also involved with a catch and release policy which helps to sustain a healthy population of trout here. 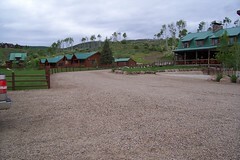 Located in the Routt National Forest in the heart of the Rockies with Wyoming just a stone throw away, this ranch offers everything you could want for in a vacation and more. 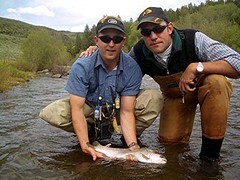 The first day the Colorado Cutthroats were reintroduced into the waters of the Little Snake River was July 23, 2002. 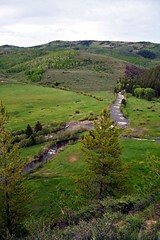 Many fingerlings to 9" long were planted there as well as a special portion of water on the Ranch designated specifically for the reintroduction of the Colorado Cutthroats in cooperation with the help of the Wyoming and Colorado Department of Wildlife. 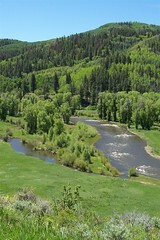 These waters will offer their guests a rare opportunity to catch magnificent Colorado native trout species. 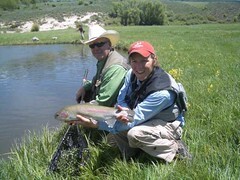 Additional Trout species found at Three Forks Ranch include browns, brookies and rainbows. The Three Forks Ranch has a team of full-time guides who are considered consummate professionals in their field and are all Orvis certified. From beginners to Experts, their guides are more than happy to share their extraordinary knowledge of fly-casting, insect entomology, river and lake fishing tactics. Their guides know each section of waterway intimately, and ensure angling pressure is constantly controlled and monitored to not only maintain the health of the trout but also to give one a sense of solitude when here. The ranch in 2005 just added the Three Forks Aviation charter service that now helps to alleviate travel dilemmas. A helicopter service was also added to help shuttle guests around the property for more of a dramatic experience here, which means you never have to fish anywhere close to where you’d fished previously. Other top notch activities here include horseback riding, use of their ATV “quads” to ride around the property or use for fishing, a European style clay pigeon 14 station shooting range, hiking trails, and in the winter soon to be available snow cat tours, cross country skiing and much more. The area is truly an outdoorsman paradise inhabited with an overabundant amount of animals such as the Pronghorn antelope, Mule deer, elk and even the occasional eagle. It is concept of meander reintroduction that Rosgen took with him when faced with restoring the Little Snake at Three Forks. By bringing back the natural sinuosity and meandering of the river, Rosgen was able to return the Little Snake and its tributaries to a more natural state. The main channels of the river were reshaped in specific locations to create deeper pools and the width on the river was significantly decreased to reduce the excess sediment deposition. In addition to the main stems of the three forks, smaller side channels were constructed for fish rearing and spawning. Natural reproduction has already stated occurring through the river system in side channels and below cross veins and J-hooks. In addition to the side channels, several off-channel oxbow lakes were developed to serve as “beaver dam” plugs for 75 acres of wetlands enhancement and habitat diversity of beaver, muskrat, and waterfowl. 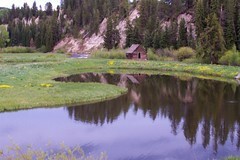 Two of these ponds are actually separated from the Middle Fork and actually contain native Colorado cutthroat throat. In a project with CDOW and Wyoming Game & Fish, Three Forks Ranch is offering these agencies the use of these ponds for brooding purposes. The magnitude of the extent and speed of this project is truly astounding – in a mere seven months a 40-man team assembled by Linderman and Rosgen moved over 22,000 boulders from a nearby boulder field to create over 2,000 structures to help restore trout habitat. According to Rosgen, “We built a series of J-hooks, W-weirs, and cross vanes for the purpose of reducing the stress on the river banks. These structures help divert the stream’s flow and velocity towards the center of the river, while at same time creating deep pools and seems that provide excellent trout habitat”. In addition to the boulders, hundreds of willows were relocated in an effort to stabilize the banks of the river, reduce stream bank erosion, and increase wetland acreage and quality, according to Kristin Keith of Montana State University’s Wild Fish Habitat Initiative. Once the restoration was complete, it did take about two years for riparian vegetation to fully return and, correspondingly, the insect hatches returned as well, according to Linderman. Currently, the river is a dry fly-fisherman’s paradise with Rainbows eagerly taking to hopper and caddis patterns throughout the summer. In addition to the improvements Three Forks has made towards cattle management, Linderman has also led the charge to improve their wildlife management practices. 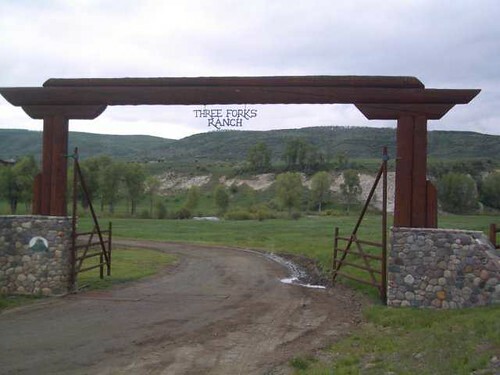 More specifically, Three Forks is one of two dozen ranches throughout Colorado participating in the Ranching for Wildlife program. 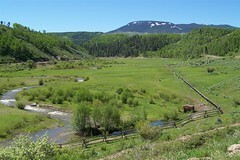 This program was initiated in 1985 by the Colorado Wildlife Commission to provide incentives to large landowners to better manage their lands for wildlife benefits. This program has opened up over a million acres of prime private wildlife habitat to limited public hunting. The Ranching for Wildlife greatly benefits Colorado residents by providing guided access to all parts of the ranch that are hunted by the private clients and lower hunter densities. If you have questions on an issue related to Ranching for Wildlife, you may send them directly to wildlife.dowinfo@state.co.us. 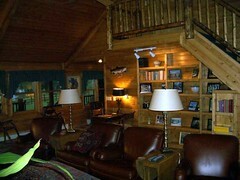 Dine, socialize or simply relax by the beautiful lodge situated on the scenic Little Snake River. You will definitely be able to renew oneself with breathtaking scenery and most importantly superb fishing. After each day of fishing, their friendly staff and guides meet back at the Lodge around 5pm to socialize, talk about the ones that got away, enjoy a few cocktails then beg for Advil to cure that aching elbow pain from catching so many large trout. Today the Three Forks Ranch offers an array of the finest and most diverse fishing in the American West with repeat customers growing steadily as well as the pictures of Trophy fish hovering the main Lodge’s wall display. I can honestly say that it is quite rare to find such a place that not only caters to your fishing aspirations, gracious staff, 5 star amenities and most important that desire to book another trip back here as soon as possible. Tradd Duggan is a Georgia native and free lance writer that has been Fly-fishing since his days of living in the Yellowstone Region some 15 years ago. 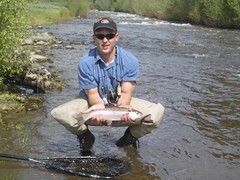 He can be found fly fishing on a weekly basis taking groups of eager fisherman to some of Colorado’s best water. In addition, Tradd is also on the Board of directors for the Denver Trout Chapter and has been involved in numerous Conservation organizations over the years.